In large cities all around the world, badly-planned elevated highways have created vast expanses of ugly dead space. As populations expand, and the planet refuses to get any larger, urban areas are looking to reclaim underused property wherever they can find it. This has created a global trend (documented several times here in REVITALIZATION) focused on innovative revitalization of these spaces. In New York City, that work is being led by the Design Trust for Public Space. 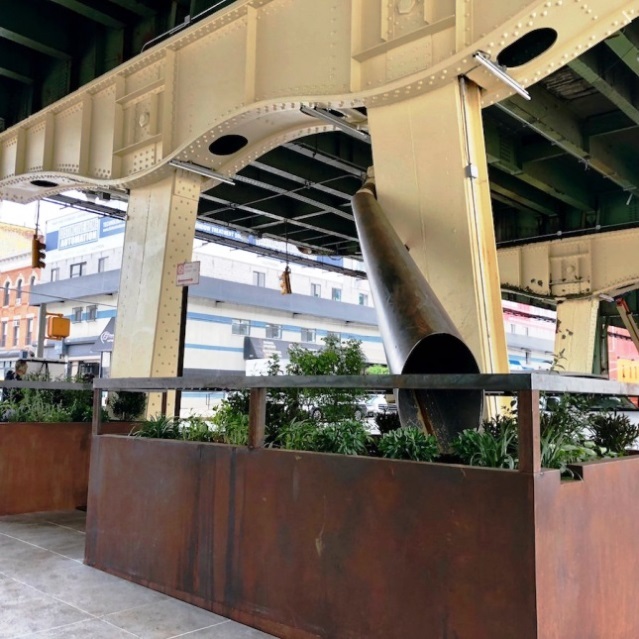 Together with the NYC Department of Transportation (DOT), they have created the first El-Space pilot installation below the Gowanus Expressway. It’s at 36th Street and 3rd Avenue, adjacent to Industry City in Brooklyn‘s Sunset Park neighborhood. Stormwater drain at the El Space pilot. The Sunset Park installation—the first of three pilots—culminates a five-year study in how New York City can bring back to life-unfriendly spaces beneath aging elevated infrastructure that spans hundreds of miles of highways, bridges, subways and rail lines. New York City’s elevated transportation infrastructure divides and pollutes neighborhoods. Vehicle exhaust and stormwater runoff of debris, oil and heavy metal burden the environment. The multiple jurisdictions over these structures shared among the city and state departments of transportation and the Metropolitan Transportation Authority complicate improvement efforts. Another challenge is to sustain funds for maintenance and programming. 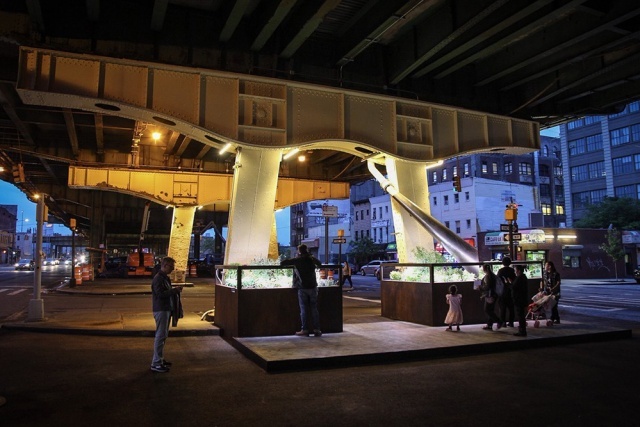 In 2013, the Design Trust for Public Space initiated their program, Under the Elevated: Reclaiming Space, Connected Communities, in partnership with NYCDOT. 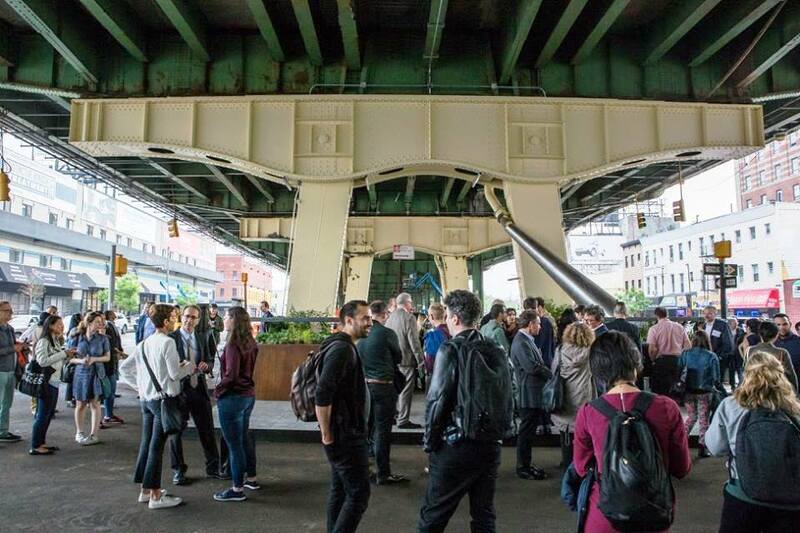 Under the Elevated puts New York City at the forefront of the growing national and international trend of reclaiming aging elevated transportation infrastructure and the land associated with it. The project followed the Design Trust’s Reclaiming the High Line study with Friends of the High Line, which convinced city officials that the best use of the decommissioned rail line was a public park and foresaw the immense potential for public space not only above, but also under elevated rail or highways. Since 2013, Design Trust for Public Space and NYCDOT have focused on these sites for their potential value for urban communities and the opportunities they offer to address systemic social, environmental, economic and racial inequities. Improving mobility and safety for pedestrians, fostering public health, and linking communities to job and amenities is our goal. They surveyed the inventory of land and conducted participatory workshops at different sites throughout the city to solicit input from community members for improvements ranging from lighting and noise management to recreational amenities. That led to the creation of a model for scaling up projects from pop-up to pilot to permanent. We produced temporary pop-up installations in Chinatown and in the Bronx to inform our next phase of work. For the Sunset Park pilot, they met with community members through charettes and onsite gatherings and formed an advisory board to understand their vision and priorities. Their concerns were tied to the urgent need for improving pedestrian safety, while ensuring sufficient parking space for the community. The first pilot launched on May 17, 2018, underneath the Gowanus Expressway. Large custom planters capture and filter stormwater runoff from the highway above, and plants clean the air as well. New lighting fixtures and the elevated structure painted a cheerful corn silk yellow enhance illumination for people at the intersection, and a central walkway provided a convenient path for pedestrians. The pilot contributes to the creation of a permanent toolkit of streetscape elements within NYCDOT. This toolkit can be employed in capital projects for elevated infrastructure citywide to address design, planning, funding, and maintenance holistically. This comprehensive approach will allow NYCDOT to move beyond case-by-case development of these sites to a systematic set of practices for fostering valuable community uses with partners citywide. The city plans to create more el-spaces throughout the five boroughs. Design Trust and NYCDOT are partnering to implement two additional sites – Rockaway Freeway and Dutch Kills Street – whose additional partners are the Rockaway Waterfront Alliance and Rockrose respectively. A green infrastructure installation featuring a steel planter representing a dunescape, is located at the A train Beach 60th Street station in the Rockaways, at the corner of Rockaway Boulevard and 60th Street. The planter captures and filters storm water from the elevated A train tracks. Another green infrastructure pilot will be installed at Dutch Kills Street in Long Island City. NYCDOT is also pursuing three additional sites: Brooklyn Bridge Arches in partnership with the Old Seaport Alliance in Manhattan; Jerome Avenue at Burnside Avenue in the Bronx that will serve as a precursor of a forthcoming $50 million capital project; and Livonia Avenue, Brownsville, that will prototype new pedestrian and elevated train station exterior lighting. El-space can provide new land resources and foster infrastructure capacity; promote neighborhood access and mobility; supply an identity and people-centered lighting for commercial corridors; offer new paths and trails for walking, cycling, and other healthy forms of recreation; contribute to a city’s storm water capture goals and resiliency plans; become a place for local gatherings and events; and host markets, retail amenities, and entrepreneurial opportunities. The Sunset Park pilot launch on May 17, 2018 also featured a site visit with NYCDOT Assistant Commissioner Wendy Feuer and Director of Urban Design Neil Gagliardi, Industry City CEO Andrew Kimball, alongside Design Trust’s El-Space Fellows landscape architects Tricia Martin and Winston Ely, urban designer Quilian Riano, and lighting designer Leni Schwendinger. Design Trust’s executive director Susan Chin moderated a panel afterward featuring eminent public space leaders from across North America looking at elevated infrastructure. The following day, the El-Space Forum brought together leading experts and practitioners at AECOM’s Industry City office to identify key obstacles through project case studies, share knowledge and experience affirming a range of values for el-space projects, and consider innovative strategies for optimizing these underutilized spaces. This collaborative work should yield creative, practical, and equitable solutions to benefit urban communities throughout North America and the globe. Featured photo of the pilot el-space under the Gowanus Expressway in Sunset Park courtesy NYC DOT. See Design Trust for Public Space website.